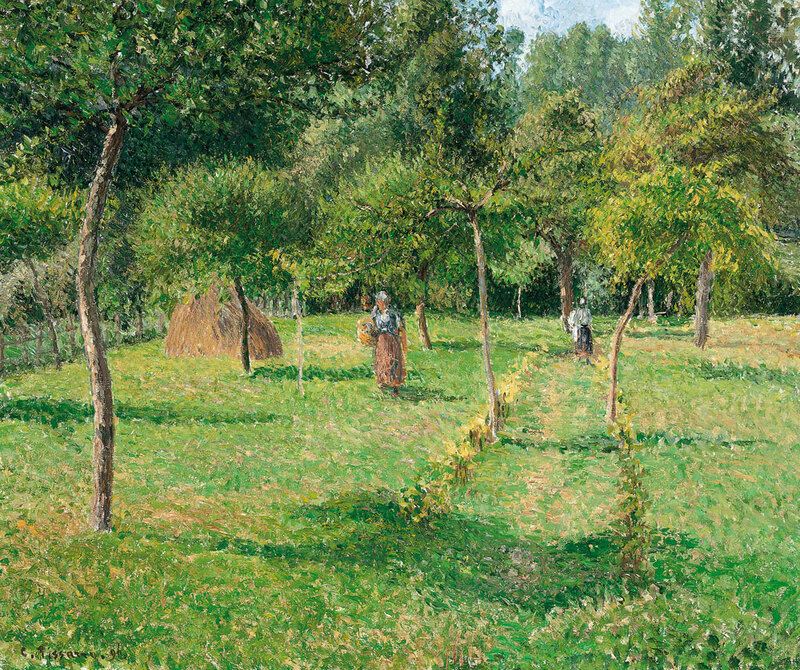 PISSARRO IN SPAIN — THIS SUMMER–IT’S PISSARRO! AN EXTRAORDINARY EXHIBITION IS OPENING IN JUNE IN MADRID!! Perhaps the gorgeous painting shown above will be among those in the exhibition at the Museo Thyssen-Bornemisza. THE TIMING IS EXCELLENT TO SEE PISSARRO AND THE PORTS IN LE HAVRE, FRANCE AND PISSARRO IN MADRID, SPAIN THIS SUMMER. “The full dimension of the port motif was realized by Camille Pissarro in an important series of three Norman ports, Rouen, Dieppe and Le Havre, that he worked on between 1883 and 1903. Le Havre is reached easily by car or by a short train ride from Paris or Rouen. See www.sncf.com/en/passengers for more information. PISSARRO’S PLACES — BOLD EXPERIMENT!! How will this painting* look in PISSARRO’S PLACES? Camille Pissarro constantly pushed the limits of painting and embraced most things modern (except the Eiffel Tower). So I think he would approve of this. Traditional publishers would not take on this 150-page book because it might not be profitable in today’s business environment. Self-publishing is the solution—for many authors in all categories. My publisher is Art Book Annex—that’s right, my blog is publishing my book in print! Thankfully, my public relations background left me with decades of experience working with editors, designers and printers. PISSARRO’S PLACES has been professionally edited and professionally designed. The printing will be done by Lightning Source, a company of Ingram Content Group, the world’s largest and most trusted distributor of physical and digital content. They provide books, music and media content to over 38,000 retailers, libraries, schools and distribution partners in 195 countries and work with more than 25,000 publishers. Lightning Source provides digital print production, also called “Print on Demand,” which means that using the computer files I supply to them, they can print any number of copies as they are needed—even just one copy. The risk lies in the quality of the reproductions. This new technique is nothing like the complicated printing used for exhibition catalogues, and the paper will not be heavy and shiny. But I’ve examined their sample books with photography and illustrations, and I’ve consulted with design and printing experts. We believe it will work. Stay tuned, and hear the results when I get the first proof!! 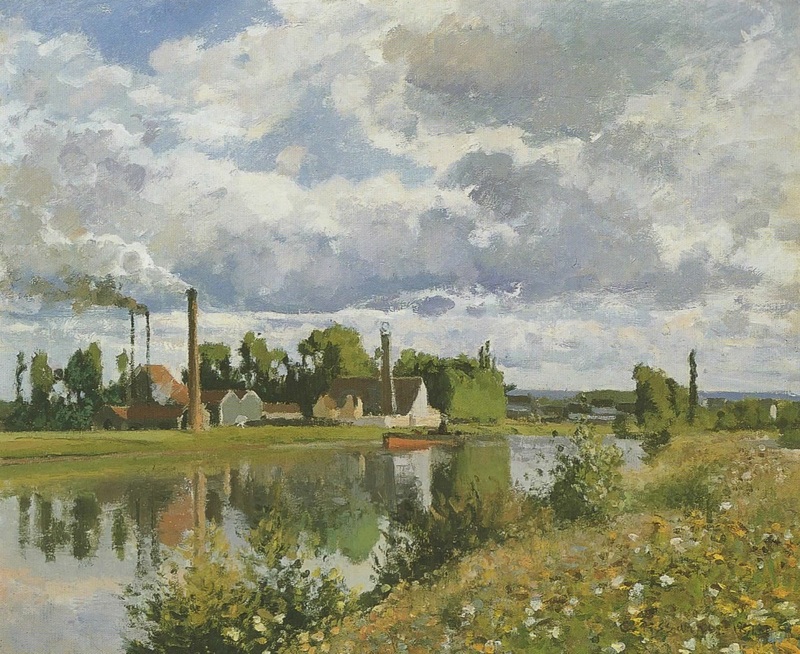 *This beautiful painting is Factory on the Banks of the Oise, Saint-Ouen-l’Aumône, painted by Pissarro in 1873. It can be seen at the Sterling and Francine Clark Art Institute, Williamstown, PA. The catalogue raisonne number is PDR 300. It will be in the chapter on Pontoise in PISSARRO’S PLACES. 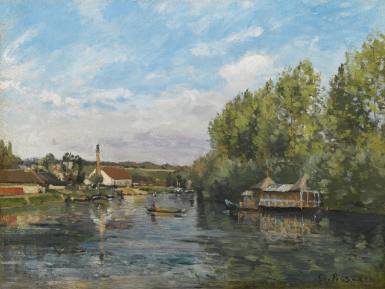 This gorgeous Pissarro painting was auctioned yesterday at Sotheby’s. The final price was 914,850 GBP or in US $1,431,690. How fortunate is that lucky buyer!! See the previous blog for more information on this painting and another one painted in that same location.